Whether you have already grown out of the acoustic guitar and want to go electric, or your desire is to rock right from the start, the choice might not be that easy. Mainly, it’s because the market is over flooded with quite affordable electric guitars, which come in all varieties, shapes, and sizes imaginable. That’s why we’re here – to guide you through the unnecessary and lead to you to the best value electric guitars. Nowadays, rock-n-roll is much more affordable than ever. Below we have a list and reviews of the 10 best beginner electric guitars currently for sale online. Best Choice Products (often called “BCP”) aren’t exactly a brand that deals with guitars and guitar accessories – their catalogue of goods include all kinds of things, ranging from compact washing machines, over gym mats, to beginner guitar bundles. Now, even though they might not seem well-versed with guitar manufacturing technology, they’re certainly inventive with their work, and most of their products boast versatile characteristics – the same goes for this guitar bundle. It comes with all the necessities a beginner needs to get started right out of the box and to top it all off, it’s shamefully cheap, even by “cheap” standards. At first glance, Best Choice Products beginner guitar bundle appears as a mediocre newbie set. It comes outfitted with a small, low-power GA10 amp, a set of replacement strings, a guitar cord, and a carry case, so it’s safe to say these bonus features are enough to declare this bundle as “valuable” for the cash. Now, the first impression is very important, as we often find ourselves in the situation that we either feel drawn or repelled by a certain thing – you might feel the latter at first, given that the guitar contained within this bundle is cheap and mediocre at best, but it’s absolutely perfect for beginners and newbies. Aesthetic-wise, you’ll be able to choose between four guitar color variants, including black, blue, green, and sunburst. 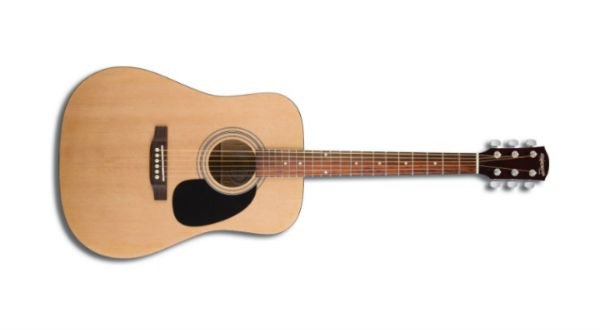 Even though this guitar looks pretty plain, you could spend hours and hours of searching for a more beautiful one without finding it within the price range. Why is this model so good for beginners? Guitars for beginners usually come in “bundles” or “packages” which are comprised of various guitar accessories and helping tools that aim to help the newbies figure out what’s what – the Best Choice Products bundle is a perfect example of a “good” beginner bundle. You’ll get a small amp on which you can practice your newly acquired skills, a set of replacement strings which come in handy in situations where you popped one or two, but you’ll also get a guitar power cable. That’s not all, though – the brand has pitched in a guitar pick, a decent carry case, and a tremolo bar (not to be confused with tremolo system). In all fairness, any guitar bundle this cheap could pass for a “best beginner electric guitar package”. There are just so many things inside that would probably cost more if purchased standalone. On the other hand, most beginners don’t even know what they need, so this is your safest bet of buying everything without thinking too much about it. The guitar itself is quite average, even mediocre in terms of quality, but the plethora of bonus accessories is more than enough to compromise for its little flaws. Surely you’ve heard about Epiphone – one of the most prominent leaders in the guitar manufacturing world. They’ve been around since 1873 which is approximately 145 years – this much time was more than enough for them to perfect their production and set the level of technology for future generations. Epiphone boasts a huge menu of premium-class guitars, but they never neglected the needs of beginners and less-experienced guitarists. Even their cheapest guitars are characterized with quality work all over, and the Special-II is not an exception. The word “Epiphone” next to the name tag of a guitar always implies quality is at work, so our first impressions of the Special-II Vintage Sunburst were pretty much one-sided and accurate. This is a phenomenal guitar that belongs to the lower bracket of the “affordable” price point category, as well as one of the few premium-quality entry-level Epiphone guitars. With a body made of Mahogany, this outstanding guitar emits a fabulous, memorable tone. It’s as durable as can be, and its hardware only complements the already-great soundstage. 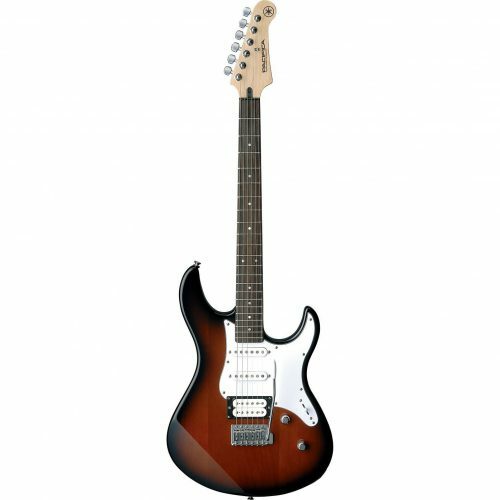 Special-II Vintage Sunburst features a set of 700T pickups and a rosewood fretboard – though plain, these features are not commonly seen in the setup of a budget guitar. 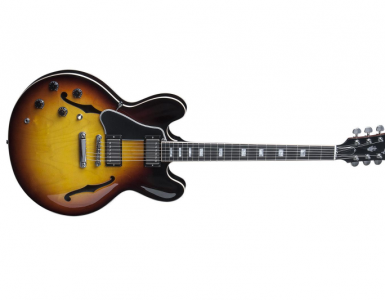 Lastly, the Vintage Sunburst styling of the Epiphone’s Special II makes it excel in aesthetics like no other. It’s safe to say that this might be the single most beautiful budget-level electric guitar, but nothing less was ever expected of such a famous brand as Epiphone. This is a “cheap Epi guitar”, which basically means it’s awesome for everyone, not just beginners. It boasts a superb level of playability and excels in numerous spheres of performance – if this seems like too much of a “tech talk”, the Special II Vintage Sunburst is better than most of budget, entry-level guitars. On the other hand, not everything about it shines. Namely, you won’t get any special guitar accessories, such as a gig bag, guitar picks, tuners, extra strings, or such. This isn’t necessarily a bad thing, but it would’ve been better if it were the other way around. In summary, every affordable Epiphone boasts a high value for the cash, so it’s safe to conclude that this particular model deserved its place among the best electric guitars for beginners. It doesn’t feature any noticeable flaws, and it’s quite apparent that Special II is a bit “inferior” to Epiphone’s more expensive counterparts, but it’s worth every single cent, guaranteed. Sawtooth makes some of the best guitar gear products within the “affordable” price point category, and their ES Series is quite famous, despite the brand being an underdog on the scene. This outstanding electric guitar bundle is everything you’ll need to boost up your guitar skills, as it comes with a plethora of guitar accessories, not to mention a high-quality ST-ES-SBB-BEG guitar. Initially, we were very happy with what we’ve found. This guitar bundle features a small, yet formidable amp, a set of premium-quality features, and a magnificent outfit of complementary accessories. The guitar features a Sycamore body adorned with a beautiful sunburst finish, as well as the astonishing black pickguard, a c-shaped neck made of maple, rosewood fretboard, and 21 medium-jumbo frets. What’s more, there are three single-coil pickups and five-way switch onboard, making it one of the best beginner electric guitars in terms of versatility. Oh, you’ll also be able to choose the color style – there are Black, Candy Apple red, Citron Vanilla Cream, Fire Brick Red, and Sunburst color variations at your disposal. 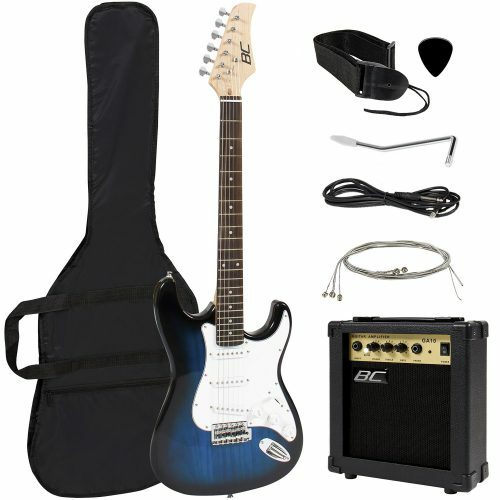 Essentially, this is a cheap bundle which comes with a set of necessary accessories every beginner guitarists needs, such as the portable 5-watt amp (however, the batteries are not included), the ChromaCast power adaptor, a set of four guitar picks, a guitar strap, a gig bag, and a tuning pipe. You’ll also get to benefit from free online lessons – this is, perhaps, one of the best beginner-friendly features included in this bundle. In truth, Sawtooth’s ST-ES-SBB-BEG ES Series electric guitar bundle is one of the finest guitar packs within the price range. It doesn’t cost much, but it excels in nearly all fields of performance, including durability, aesthetics, sound, and more. We highly recommend that you at least try it out if you haven’t already. Davison Guitars (or shortly just “Davison”) is the name of the brand that you will see quite often on the shelves of many a guitar tech store. These guys specialize in producing entry-level guitars and bass guitars, which is just one of the reasons why most beginners start their journey with one of their models. It’s safe to say that you’ll have a hard time understanding which model is which, as they’ve piled them and categorized them in series from 300s to D9000s without too much thought (apart from the year of production, apparently). That’s why if you are purchasing online you might see “Guitar Bundle” or “Guitar” without a model number next to it, but rest assured, they make them good. This is the first bass guitar we are reviewing so far, and it’s one of the best models in the “affordable” price point category we could dig up. Even though most beginner guitarists stick to their instrument, it’s highly advisable that you at least give the bass a try – this instrument is significantly easier to play on the basic level, and given proper instructions you’ll figure it out in no time. 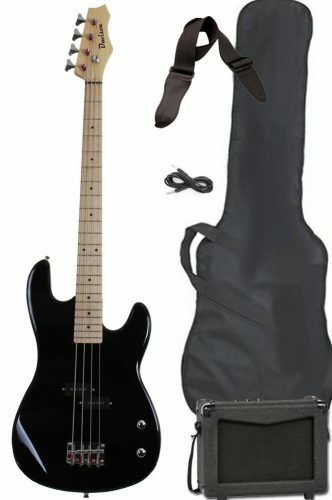 In essence, this is a full-size high-quality bass which comes with the bare necessities, such as the amp, a carry case, a guitar cable, and a guitar strap. It features two single-coil pickups and two volume/control knobs which allow you to accurately control the tone, but there’s a special reason why this bass guitar is so good for beginners – find out more about it in the section below. The first reason why Davison Guitars Electric bass guitar is so good for beginners is because it comes outfitted with a full beginner set – there’s a low-wattage amp which won’t bother your neighbours, a convenient carry case which you can use for easier transport of your instrument, a power cable, and a neat little strap. Now, the second reason is the impeccable hardware. This bass guitar comes outfitted with a premium-quality set of machine heads which prevent this bass from spontaneously going out of tune. Even though this won’t mean much to you as a beginner, it’s very important, as you will be able to practice your hearing and boost your skills faster. The last, but certainly not the least – the “action” on this bass is great. Now, the “action” represents the gap between the strings and the frets. Push it too high and you’ll need more strength to fret down the note – one of the biggest problems beginners usually face. Very low “action”, on the other hand interferes with the sound – it’s safe to say that the action of this electric bass guitar is “optimal”. Basses and electric bass guitars usually don’t come cheap – when they do, they’re usually awful in terms of performance, sound, durability, or all three altogether. Now, this model represents an exception. It’s pretty cheap, but it boasts a high level of quality and value for the money due to its superb action, the goodies which come as complementary features, and such. Let’s put it this way – versatile brands such as Hinkler are in abundance, but they’re often very unreliable. 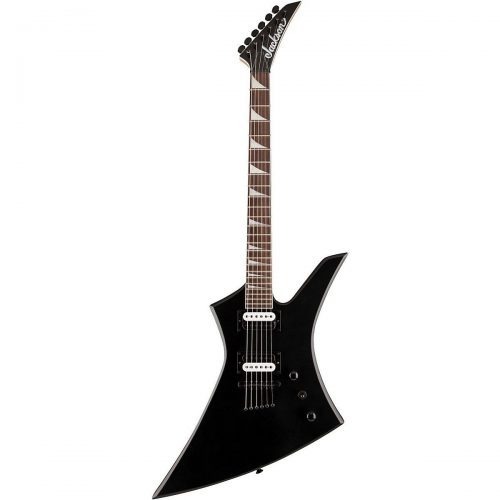 Now, since we’re mainly talking about guitars and guitar manufacturers, we’ve obviously dubbed this brand as an exception – these guys sell all kinds of things, but not a single product with their name plate is “bad” per se. It’s hard to determine what Hinkler specializes in, but they’ve done a pretty good job with the EBB Electric Blues slide guitar. They’ve also chipped in a neat little “you can play Blues Box guitar” CD which will certainly help you learn the ropes. Looks can certainly be deceiving, and we had a wrong first impression when we opened this slide guitar from the box. It looks a bit funny, maybe even inconvenient, but it does the job fairly good. It holds the tune quite well, it’s absurdly easy to play it, and even if there’s something you didn’t understand, there is a neat little “You can play Blues Box Guitar” instructional CD as a complementary feature. Not only does it help with figuring out the basics, but it’s quite motivational alright. 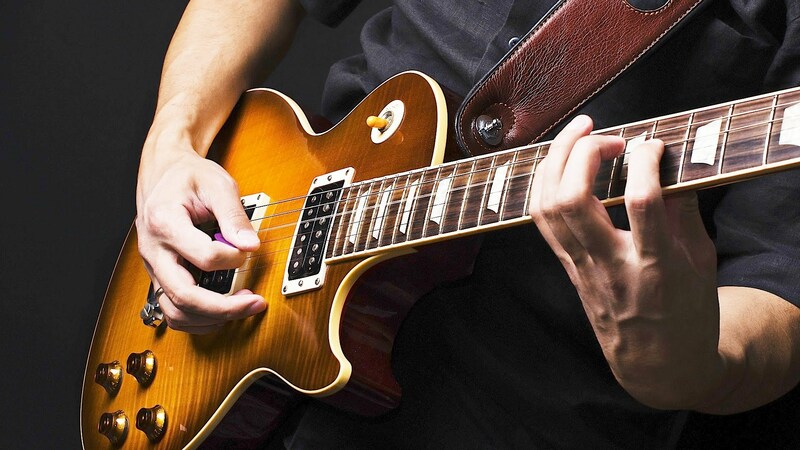 Blues beginners are in for a challenge more than guitarists who prefer other genres – this particular type of music is really hard to play, and people are often stuck for days figuring out the scales, songs, and such. There are two reasons why this guitar is so good for beginners – it’s very, very cheap, and it boasts a superb level of playability. Blues is one of those music genres that you have to feel before you play, and it’s one of the least represented genres in a beginner’s repertoire – slide guitars are a necessity, and if you are one of the few who wants to learn how to play blues, there’s no better way to start than going with Hinkler’s slide guitar. It’s a plain, remarkably cheap guitar – nothing special really, but the fact that it comes with a handy instructional CD with over twenty tracks means something. Apart from that, finding a slide guitar which is this cheap is all but easy, so it’s safe to say this one holds quite a value for the money. 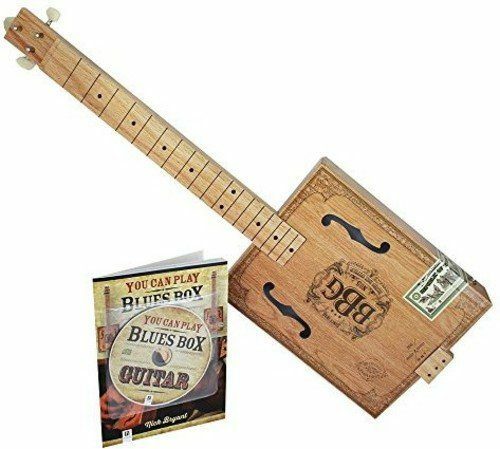 Blues legends such as Jimi Hendrix, Robert Johnson, Muddy Waters, Lightning’ Hop kinds and Carl Perkins bean their music careers playing cigar box guitars! Over the last decade, there has be a resurgence and renewed interest in all things homemade, and a groundswell in cigar box instruments is well underway. CD contains over 20 tracks! Kicking it off with an all-time classic, Epiphone Les Paul Standard. It’s no secret that many guitarists wish to have the original Gibson Les Paul Standard but few can afford it. Epiphone, however, brings a great deal of that famous Gibson performance while keeping it below the much-sensitive $500 price range. There isn’t much to be said about this guitar that wasn’t been said before. It’s all there – the classic shape, the heavy mahogany body with a maple top, the rosewood fretboard, the abalone inlays between the frets. An instrument that’s built to rock. The electronics are signature Les Paul Alnico dual humbuckers complete with two volume and two tone knobs. This guitar holds tuning really well so there’s not much to complain about the hardware. The greatest thing about Epiphone Les Paul Standard, though, is the sound. It’s warm and deep with just enough punch to play almost any style of music – from blues to metal – with confidence. Overall, it’s probably one of the best beginner guitars ever. If the $400-tag doesn’t scare you, it’s a great deal. Now, this is a guitar worth of your attention. A unique combination of strat body and tele headstock, this guitar is bound to draw you some attention. And it’s vintage, yeah! In a nutshell, we have a basswood body, C-profile maple neck, and maple fretboard. In the electronics department, this Squier features a potent SH pickup configuration with rotary pickups selector and push-pull coil tap. All this gives Squier model a great tonal versatility and easily recognizable Fender tone. If you get this guitar, be prepared, however, to make some adjustments first (action, mainly) before playing as they don’t come plug-and-play. For the price asked this Squier by Fender Vintage Modified ’51 is unbeatable. A great value for a beginner. The electric guitars made by Yamaha are often overlooked by the guitar community as cheap and not capable of producing great sound. Let us assure you – they are wrong. 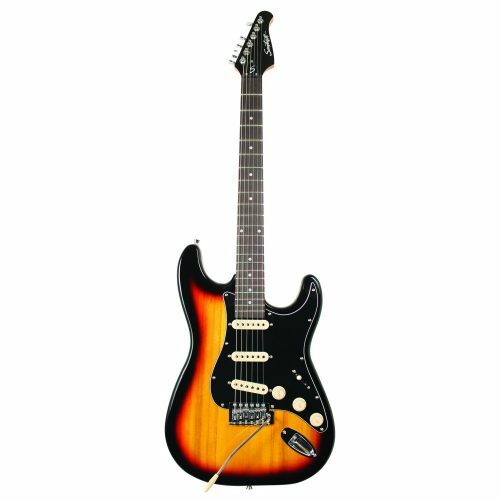 This Strat-type body guitar has the unbeatable price/features ratio. For a very moderate price, you get a guitar that looks, feels, and sounds like Fender Stratocaster. Pacifica series guitars feature alder body, maple bolt-on neck, and rosewood fretboard. Everything is put together nicely and solidly. Electronics configuration is what makes Yamaha Pacifica different from a typical Strat. Here, you have two single coils and a humbucker. This particularly suitable if you prefer heavier styles of music rather than blues or funk. The downside is that the build quality and finish are somewhat mediocre and far from you’d expect from Epiphone or the Mexican-made Stratocaster. Other than that, it’s great axe that you will thank many times for introducing you to the rock-n-roll. 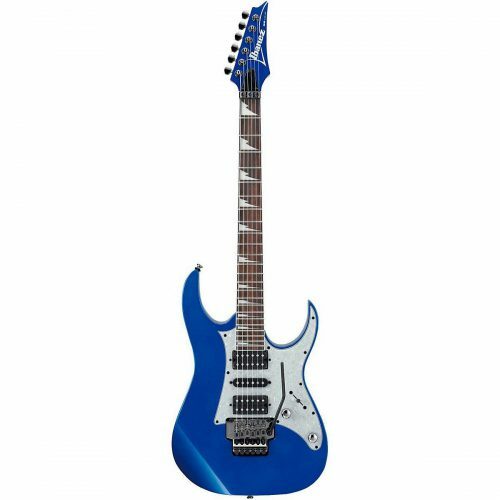 Another guitar by a Japanese manufacturer on the list, Ibanez RG Series, model RG450DX. Ibanez have a habit of giving their guitars long, difficult-to-remember model names but this one you need to take a note of. This guitar may seem pretty generic at first (mahogany body, maple neck, rosewood fretboard, Super Strat shape) – but the magic comes when you take it in your hands and start playing. 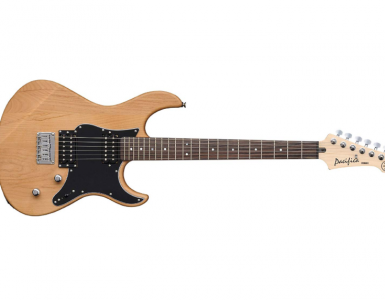 For a guitar of this price, RG450DX packs way too much power in terms of tone and attack. Although many dismiss it as a «metal axe», this guitar is actually quite versatile. Perhaps, not the first-choice guitar for jazz, this guitar handles most styles of music pretty well. The tone is warm and punchy with great depth and resonance. The pickup configuration is HSS, where the middle pickup is alnico while the remaining two are ceramic – hence, the versatility. There might be a problem, however, related to the difference in the volume output between the middle pickup (which is quieter) and the neck and bridge pickups. Not a big deal but, still, spoils the great overall impression. Yeah, this one was made for heavy music. 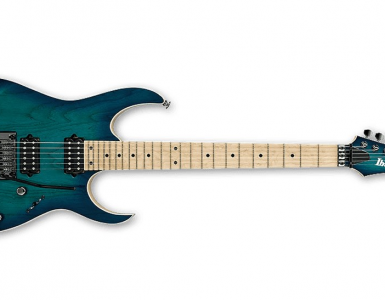 Jackson have a long tradition of making great (and affordable) metal axes, and this guitar is no exception. JS32T Kelly model features a rather unusual Indian Cedro as a material for the body and maple/rosewood for the neck/fretboard. The result is a characteristically aggressive and punchy tone that’s often seemed for by the heavy music aficionados. Although the radical Kelly shape makes this guitar not entirely for the mass public, those of you who prefer to play it loud will definitely enjoy this axe. Veterans might forgive you if you never heard about Epiphone, but the same can’t be said if you never heard about Fender. This might be the single most reputable brand in the world of guitars, and it’s only natural that we’ve decided to add one of their products on your necessities list. Fender is “responsible” for the “outbreak” of millions aspiring musicians, and it’s safe to say that you can’t call yourself a guitarist if you don’t own at least something from their catalogue – be it a guitar, a neckplate, or even a coffee mug. Basically, this is a guitar accessory which serves a purely cosmetic function. 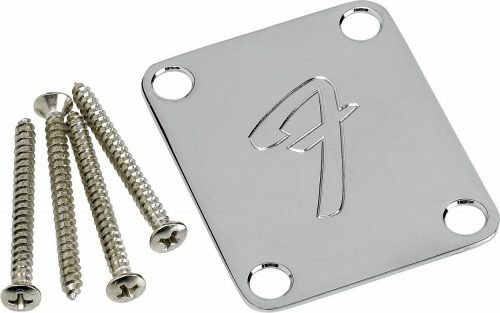 The package includes a Fender-exclusive neckplate along with a set of four screws. It’s pretty basic, all things considered, and the price might appear a bit too steep, but after all, we are talking about Fender merchandise here, so it’s safe to conclude that the value is on point. Cheap Fender guitars are rare, and by that we mean “very rare”. They mainly manufacture premium-quality high-end (often referred to as “boutique”) guitars and guitar amps, so we’ve decided to recommend one of their cheaper accessories – the F Neckplate. It’s safe to assume that this neckplate won’t help you attain guitar skills, but it might boost your confidence – having a Fender branded on the neck of your guitar could make the difference between giving up and battling on. On the other hand, you could always boast about owning a Fender-exclusive product to your friends – they don’t have to know that it isn’t a guitar. There are a couple of things that come to mind regarding neckplates – beginners who happen to own a Fender guitar might find themselves in a need of a replacement. These things tend to fall out from their place from time to time, and being prepared is better than getting stuck in a predicament. Beginners are always eager to learn, that’s a fact, but it goes without even saying that the world of guitar playing is much bigger than most of us believed, right? 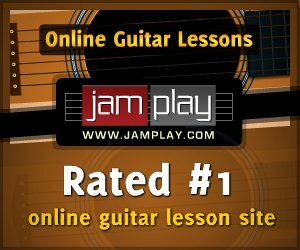 The techniques which were pioneered in 60s and 70s are now regarded as “common” due to the fact that “you can’t master a guitar, you can only hope of doing better than yesterday”. Without going into too much detail regarding the topic, let’s settle on this – you’re going to be really determined, equipped with iron nerves, and prepared to invest hours of relentless practice before you make it to the stage. Now, where should you even begin? First of all, you should start by learning what’s the difference between a regular guitar and a guitar made specifically for beginners. After you’ve understood the basic concept of a beginner’s guitar, we’ll lead you in the right direction regarding how you should start. The so-called “guitar accessories” play a key role here, so we’ll talk about them briefly after that, and finally, conclude with a short section regarding the most notable benefits and disadvantages of starting off with an amp. What are Beginner Electric Guitars? Essentially, beginner guitars are cheaper than average guitars, which must be the first thing that beginners notice about them, but that’s certainly not all. Even though these guitars are cheaper, certain models don’t lag behind in quality – if you want to stay on the safer side, though, you should always assume that they are (since they’re technically inferior). One of the main characteristics of beginner guitars is their incredible playability. The “playability” refers to the “ease with which you’ll play them”. These guitars often feature special, tender strings which are a bit more elastic and induce less pain on the fingers, but they’re sadly less durable and will pop more often than not. Another important aspect of beginner guitars is that they often come in “bundles” – brands like to label them as “beginner packages” or “beginner bundles”. These bundles contain helpful tools and gadgets which will improve your overall experience, including guitar tuners, gig bags, straps, picks, and so on – more word will be in regard to this topic in the sections below. How Should You Start Practicing? 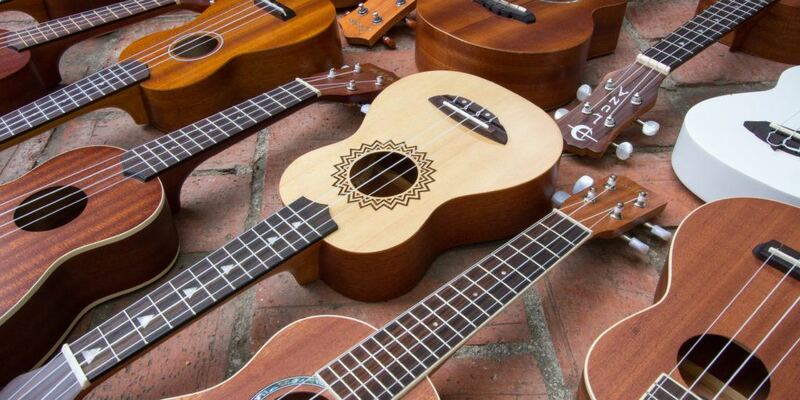 Ok, you’ve bought your very first guitar – now what? This is one of the first things every beginner sees – the euphoria kicks in, you can’t wait to start shredding powerful solos, and it’s as if the stage is but a mere miles away. The truth is, every beginning is hard – in fact, this time around it’s harder than you might think. Every beginner should start off by getting properly equipped. Buying the actual guitar is only but a fragment of your very first step. You’ll need guitar “accessories” – the tools which will help you play more easily (consult the section below for detailed explanation of the guitar accessories and gadgets). After buying the necessary gadgets, you should decide whether you want to start practicing with an amp or without it – note that both options have their benefits and disadvantages. Again, we will speak about this at a later point. Your last step is also the biggest decision – are you a prodigy who wants to learn everything on your own, or will you take a safer route by hiring a professor? Getting familiar with the guitar world and music theory on your own can be quite a tricky experience, but the things you’ll learn will be there to stay – these will be your rewards for your hard work, and most self-learning musicians never give up on the guitar. On the other hand, hiring a professor is easier – there will be someone who will train both you and your habits, but the direction in which you will go might appear “boring” or “dull” at times. In a nutshell – choosing this option will somewhat narrow down your path. Guitar accessories are, basically, the tools which have versatile functions. Some will help you get started, others are necessary throughout your entire career as a guitarist while some are there to help make the job a bit easier in its entirety. A guitar tuner is a handy little contraption which will help you tune your guitar more easily. One of the most natural ways to do it is “by ear”, but these gadgets allow you to do the same thing even if you don’t have a developed sense of “musical” hearing. 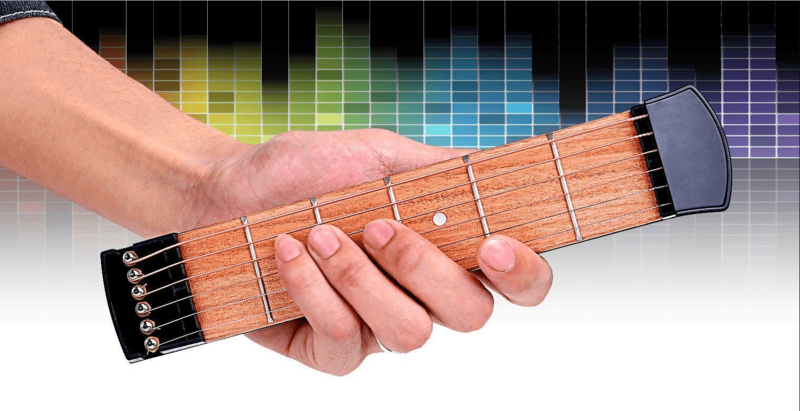 Basically, a tuner “recognizes” the vibrations (rather than sounds) emitted by your guitar and tells you which note you’ve played – the most common tuning for a guitar is “Standard E” comprised of E, A, D, G, B, E. This means that if you’ve played the “E” string, for example, and the tuner points out otherwise, you should probably “tune it up” better. The same applies to other strings. A guitar strap is commonly used by gig musicians who perform on stage, as there are little means of holding your guitar other than with it. Beginners usually sit in front of a teacher (or their PC with the “lessons videos” turned on), so a strap might not be as necessary, but it’s always handy to have it. There are numerous types of guitar straps with the only criteria being the build material. You shouldn’t worry too much, though, as nearly all beginner guitar bundles have one. A guitar pick is the most necessary guitar accessory in your arsenal unless you want to practice “fingerstyle”. Most guitar picks are very cheap, although there are some models which cost $10 or more, depending on the material used to make them. A guitar bag is your best friend if you want to play in a band. Dragging your guitar across one end of the town to the other in your hands might look silly, but even if it won’t, you’ll tire your arms while looking silly. Generally, guitar bags aren’t only meant to accommodate your instrument – each guitar bag features a compartment which can hold your other guitar accessories, most notably the cable, tuner, strings, and so on. Again, most guitar bundles feature a complementary gig bag. The tremolo bar (or the tremolo handle) is the little lever found beneath the pickups. It’s used to produce sounds which are otherwise unattainable, and it’s a perfect tool to familiarize yourself with how the “bending technique” works. Tremolo bars are not to be confused with “tremolo systems”, though. Namely, tremolo systems are delicate, complex contraptions that are installed on your guitar – the tremolo bar simply needs to be inserted and tightened in a corresponding spot. Note that not every guitar can accommodate the tremolo bar. Certain (undrilled) guitars don’t have that little hole needed to insert the bar, which is where tremolo systems come into play. However, these systems are reserved for more advanced players, as you (as a beginner) won’t find much use of them. It’s impossible to play a guitar without a set of strings, so it’s safe to say that this isn’t exactly a guitar “accessory” – rather it’s a “necessity”. Depending on the type of a guitar you are playing, you will need a minimum of six strings. There are 7-stringed, 8-stringed, and even 20-string (and above), but you need not trouble yourself with such matters, as only professionals use them. Strings are pretty plain in nature, but choosing the right set might be harder than you’d think. Generally, the string sets are categorized by their “thickness”. This thickness heavily affects the guitar’s playability and tone, but don’t worry too much – nearly all beginner bundles have a set of replacement strings if you happen to dislike the one your guitar came with. A power cable is only necessary if you intend to play using an amp. Since we are talking about beginner electric guitars, you can’t wire your electric guitar to an amp without one. These are pretty straightforward, and they’re categorized according to their length – the longer the cable, the greater the price is. Should You Start With or Without and Amp? This is one of the most common disputes between veteran guitarists – should you start playing with or without a guitar amp? 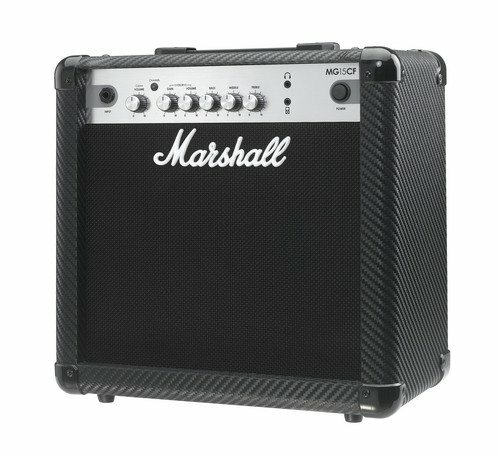 At first, it seems only logical that using a guitar amp is better than playing on “silent mode”, but is it? Simply put, you will hear every single note you play, but louder. This “loudness” will help you figure out what you’ve been doing wrong, as your mistakes will be more pronounced. On the other hand, most guitar amps have different modes of operation, such as “gain”, “boost”, “reverb”, or different channels at the very least. This will allow you to play around with the sound you’re getting, making your guitar learning experience more fun. Plugging your guitar in an amp is a wonderful experience – you can’t wait to hear the powerful sounds made by you and your guitar. Actually, it’s safe to say that you’d feel content just by playing on an amp, as it will make you feel like a rockstar. The truth is – most beginners get disappointed. Budget guitar amps and boutique high-end amps are nothing alike – the things you saw on TV or heard on the radio will have nothing in common with the sounds your amp is emitting. 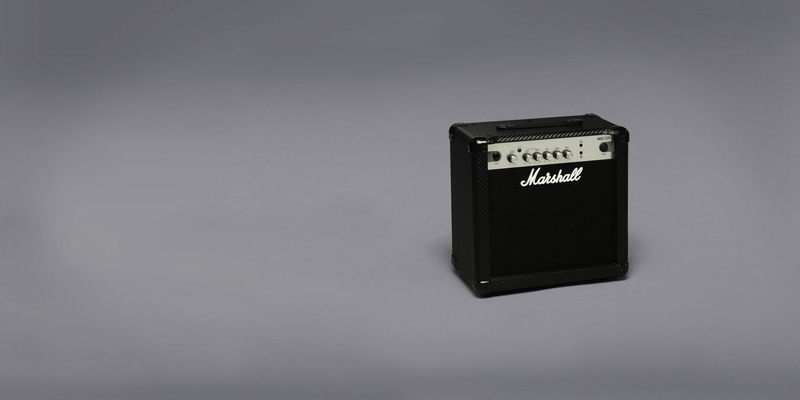 You didn’t really expect that a beginner’s bundle will feature a high-quality amp, did you? On the other hand, playing with an amp will make you rely on the sound you’re getting – your “musical” ear will not develop as fast as it would while playing without an amp. One of the most notable benefits of practicing your guitar skills without an amp is the development of your “musical” ear. This is basically an upgraded sense of hearing – it lets you notice your mistakes more clearly, which in turn helps you correct them. A developed “musical” ear is needed to tune your guitar in “by ear” as well. Further on this point, people who start practicing their electric guitar without an amp usually rely on their skills rather than their gear. This means that you’ll be able to play virtually any guitar, regardless of how good (or bad) it is. If you intend to play in a band, there are slim chances that anyone will let you join the party if you don’t have your own amp. Most “beginner” bands are called “garage” bands, as they’re comprised of kids with low-budget amps and instruments, and being in one means that you’ll have to contribute with your own low-budget amp. On the other hand, you won’t be able to learn, perform, or practice certain guitar techniques in the way they’re meant to – such as finger tapping, squealing, and such. The build material of a guitar is its very core – the woods used in the manufacturing process are “responsible” for the sound of your guitar, which is the reason why it’s so important to be able to understand the difference between various types. Alder – Maple is quite hard and provides plenty of durability and sustain. This type of material is most commonly used in the production of guitar necks and tops, mainly due to its beautiful outward appearance. Alder – Mahogany is a typical material used in the manufacturing of guitar bodies. It provides a balanced tone characterized with warmth and clarity, as it provides superb tonal resonance. bas – Even though most beginners think that “basswood is used to make electric basses”, it’s quite the opposite. This material is a derivate from Linden tree, thus it’s very soft and a bit less durable than other materials. However, it’s one of the most versatile wood materials due to its remarkably balanced sound and outstanding sustain. Alder – Guitars made of Alder are quite rare nowadays, but it was very popular back in the 50s and the 60s. The only reason why most brands refrain from using it today is because it’s quite expensive. This material hinders the bass potential but enhances all other aspects. Swamp Ash – It might sound intimidating, but Swamp Ash is actually pretty good. This material is among the most lightweight wooden build materials, making it perfect for beginner guitars. Since you are a beginner, the “playability” should be one of the main factors you will want to take into account. A guitar’s playability is determined by its design and action primarily. The design of the guitar represents how the frets are aligned and made, the gaps between frets, and generally how the guitar feels. However, most beginner guitars are built upon the same concept – the frets are usually pretty far apart, so that the player can practice chords more easily (before jumping to solos and other complex techniques). As for the guitar’s “action”, it represents the distance between the frets and the strings. High action means that the strings are pretty far away from the frets. This means that you will have less sustain and a harder time pressing down the frets, but the sound interference and hums should be minimal. 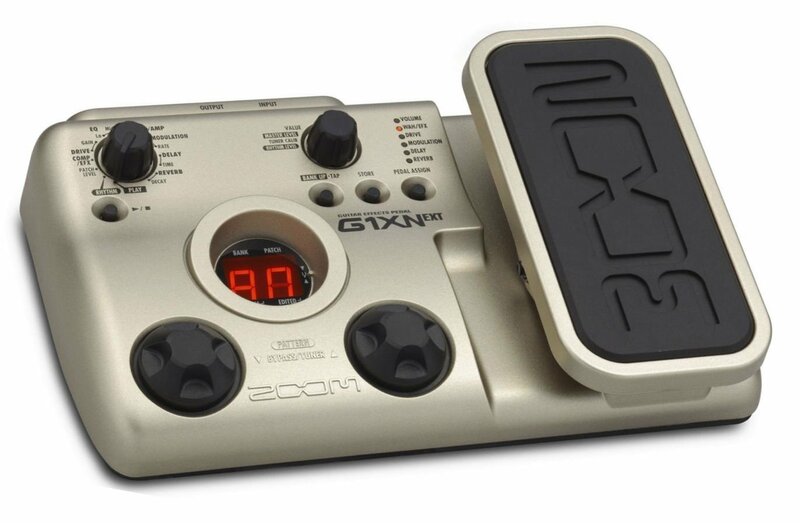 Low action, on the other hand, greatly improves the overall playability at the cost of clear sound. It’s up to you to choose which one suits you better. Most beginner guitars come at a low price – you can expect to find a decent, high-quality beginner guitar in the range of $500, but that might appear a bit too steep for kids and teens. That’s not a cause for alarm, though, as it’s quite possible to find a good guitar for beginners in the range of $100 – $200. The reason why entry-level guitars cost “so much” is quite simple – these guitars often come with a full set of beginner features known as “guitar accessories”, which, in essence, cost more than the guitar itself. As a beginner, you are probably drawn to the guitar that looks cool rather than to ones which sound good. That’s perfectly normal – most beginner guitars sound the same, and there’s little you can do apart from buying a high-quality amp (which costs 5-6 times more than your beginner bundle). In terms of aesthetics, a beginner guitar either looks awesome or plain. Some models, such as Epiphone’s Special II Vintage Sunburst can pass on as beautiful even in the higher tiers while most Fender guitars look the same, regardless of the price. The only thing we can recommend to you is that you don’t pay too much heed to how a guitar looks – the beginner guitar you intend to buy should help you get familiar with how a guitar should be played. Once the time comes for you to go on and have a proper gig, you can take aesthetics into account all you want. Now, the gratis features are one of the best things about guitar bundles. As a beginner, you probably didn’t even know what these are, but luckily, this extensive buying guide is here to shed some light on the issue. Let’s be clear on one point – if there’s a guitar bundle which comes with “all types” of accessories, we’ve failed to find it. More often than not, you’ll get a couple of necessities that allow you to practice and play straight away. The bare necessities are the guitar pick, a set of strings, and the tuner. Everything beyond this level is there to make the process easier. There are plenty of other great guitars for beginners under $500, and we, obviously, can’t review them all here. But these ten would surely please any aspiring guitar player, no matter what his/her musical background and skill level are.